The windows of the Sompet Thai Cookery kitchen are open to the Ping River. Cottonwood trees along the Ping River in Chiang Mai, northern Thailand are flowering, and soft fluff floats into the kitchen through glassless windows. There are only five students, all English-speaking fans of Thai food. 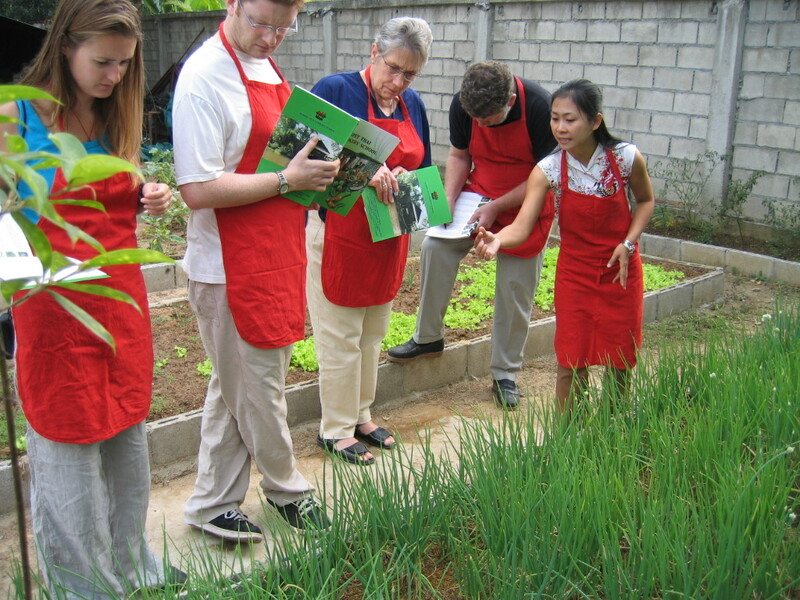 We don red aprons and meet our teacher, Ed, a charming young lady from nearby Chiang Rai. Ed takes us outside to visit the herb garden. She points out the purple-edged leaves of holy basil. There is also sweet basil, chilies, Chinese celery, garlic chives, coriander, ginger, turmeric, peppercorns, garlic, mint, cumin, shallots, pandanus, galangal root, lemon grass, and a kaffir lime tree (the limes with the bumpy rind). 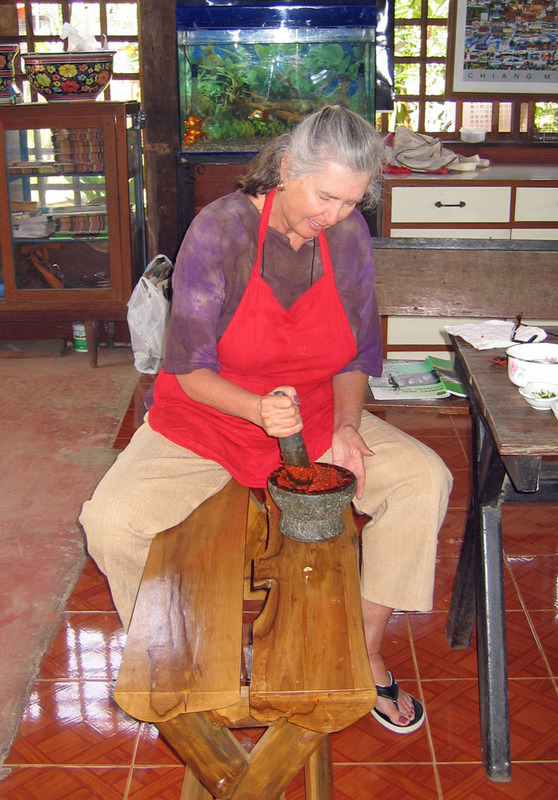 Red curry paste is pounded with a wooden pestle in a wooden mortar. Our first culinary challenge is to master a curry paste. Each of us is shown to a large mortar and pestle, which we fill with fresh shallots, chilies, and shrimp paste. This is a basic curry, but we add garlic, coriander roots, lemon grass, peppercorns and galangal. Thai curries are always made with fresh herbs. Though chilies are a common ingredient, not all dishes are hot. 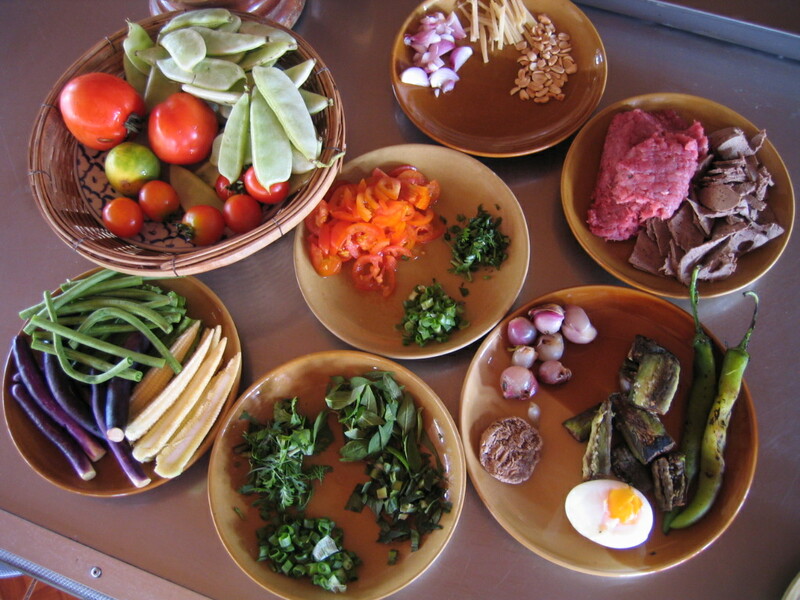 Tom Khaa Gai soup, Phad Thai noodles, and green curry paste are mild central Thailand dishes. Even so, the chef wants the dish to appeal to the eye and the palate, striving for a balance between sweet, sour, hot, bitter, and salty. You eat Thai food with a fork and spoon. Bite-size pieces eliminate any need for a knife. Portions are large enough to share with friends and family. Dishes are served in the order the chef prepares them, but a good Thai meal always has a sweet dessert to balance a meal full of strong spices and herbs. 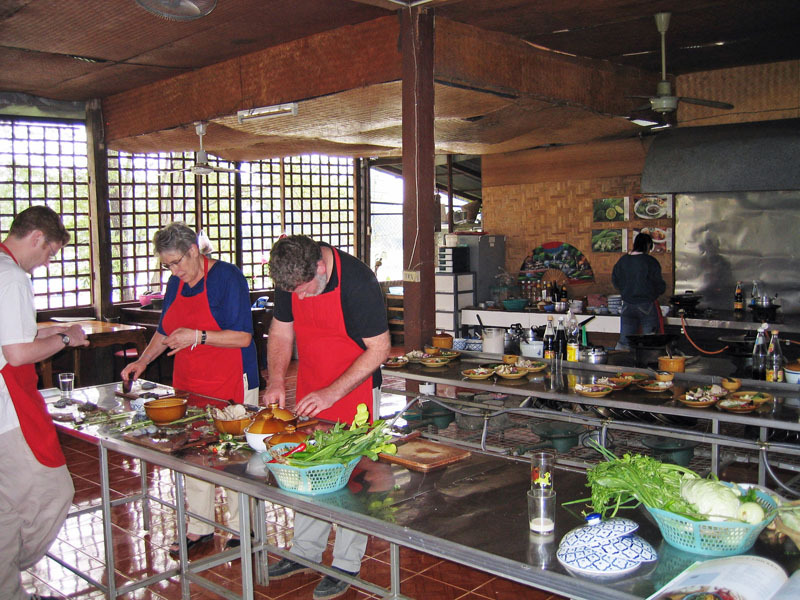 Thai kitchens contain sharp knives, a cleaver, chopping boards, a mortar and pestle for grinding herbs and chili paste, a coconut shredder. And of course a wok and a steamer (a large pot with a high-domed lid and trays that can be stacked inside). Thai cuisine is great for vegetarians, with a ready variety of cucumber, swamp cabbage, tomato-shaped green eggplants, long beans, bean sprouts, mushrooms, and spring onions. Sauces and curries are thickened with rice flour (make your own rice flour in your Ultimate Chopper or food processor). 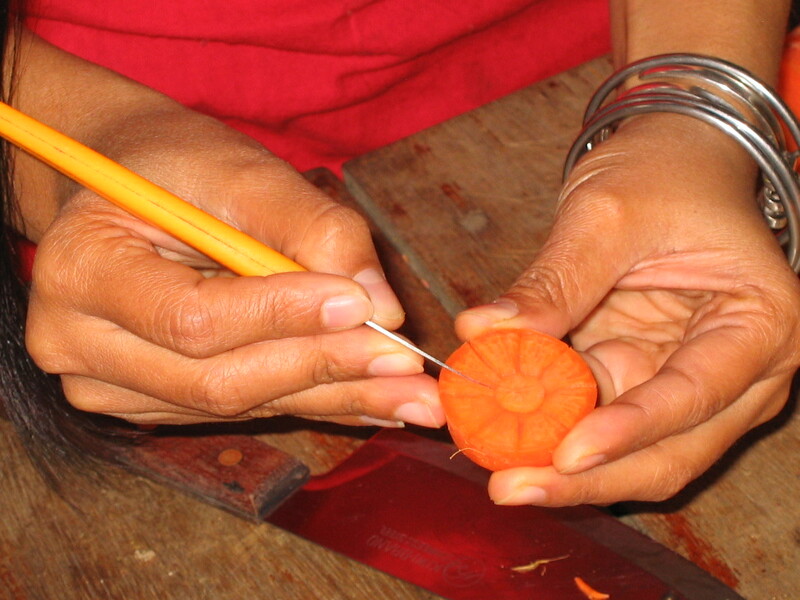 Our teacher, Ed, demonstrates how to carve a carrot rose. Finally we sit down next to the open-air windows to devour our results. In addition to a red curry paste, I’ve prepared Chiang Mai curry with chicken, lab mu (a spicy pork salad), hot and spicy chicken, eggplant salad, and a spicy dipping sauce for fresh vegetables. I take leftovers back to my husband at the hotel, we stash them in the minibar, and the next day eat them with scrambled eggs for breakfast—great way to start the day! Ed. 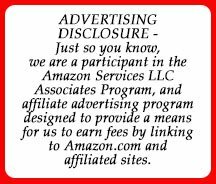 note: For fish sauce, galangal, tamarind, palm sugar and other Thai ingredients you may not find in your neighborhood supermarket, look for any Asian specialty shop.